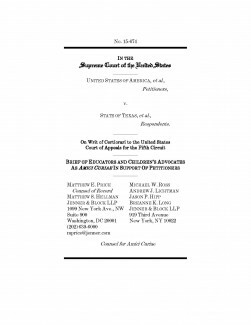 First Focus and nationally recognized education and children’s advocacy organizations spearheaded this amicus brief on why the implementation of Deferred Action for Childhood Arrivals (DACA) and Deferred Action for Parents of Americans and Lawful Permanent Residents (DAPA) programs are beneficial to children. First Focus is proud to be one of 76 signatories. In January, the Supreme Court agreed to hear United States v. Texas, the case that was brought by Texas and 25 other states to halt the President’s executive actions on immigration, including the expansion of DACA and the new DAPA initiative. The expanded DACA and new DAPA programs will ameliorate the harms caused by family separation and reduce the risk of children entering the child welfare system. The expanded DACA and new DAPA programs will benefit individuals, families and communities by allowing individuals to pursue expanded educational and professional opportunities. If implemented, the DAPA program would prevent deportation and provide work authorization to immigrants who are the parents of US Citizens or lawful permanent residents. Expanded DACA would apply to those who have been in the U.S. since before they were 16, lived in the country continuously since 2010 and have graduated high school or gotten their GED. These programs have the potential to provide immigration relief to more than 4 million individuals, including up to 3.3 million parents of minor children.